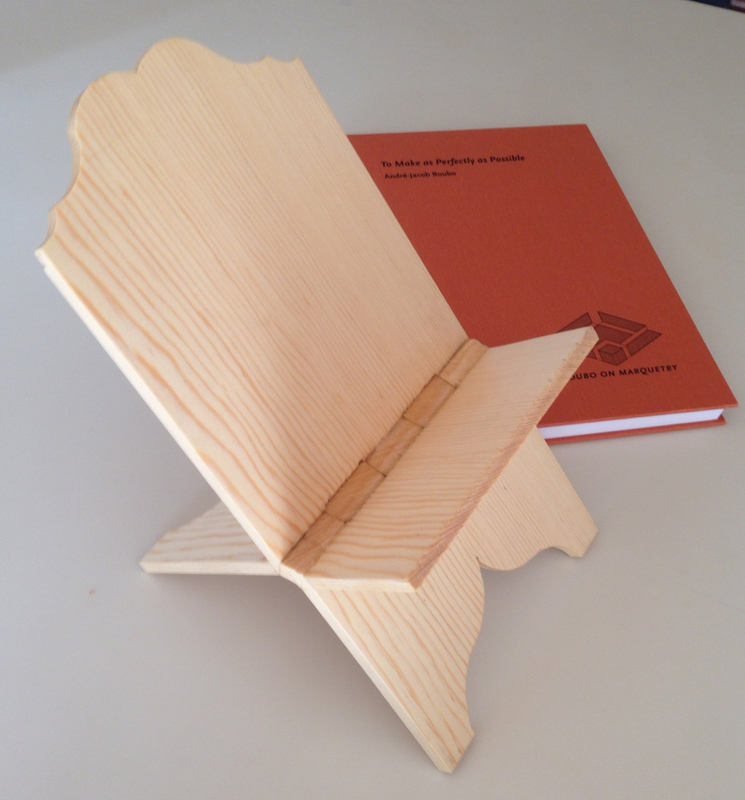 I had a couple of hours in the shop today, and made one of these “Roubo bookstand” thingies. 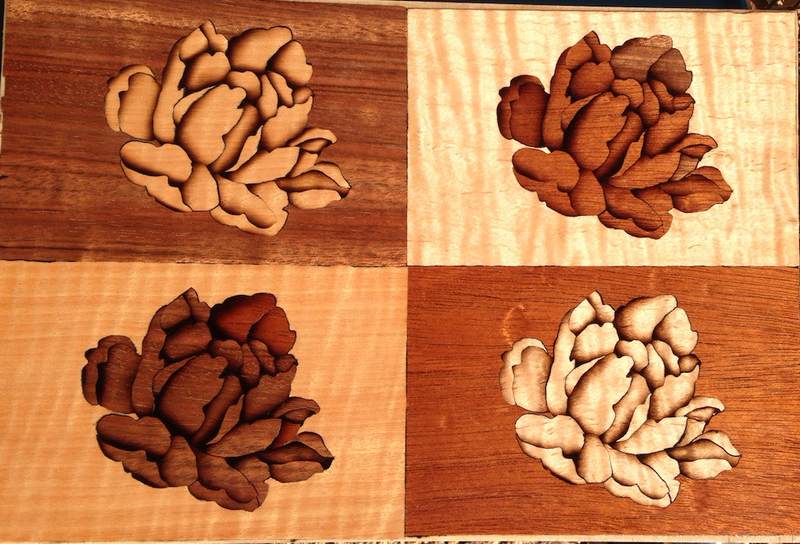 I’m sure most folks have seen this before, either on The Woodwright’s Shop, Christopher Schwarz’ blog or in PWW. I say Roubo bookstand in quotes because I believe this style actually dates from the 13th century. Regardless, it was a simple, fun exercise. 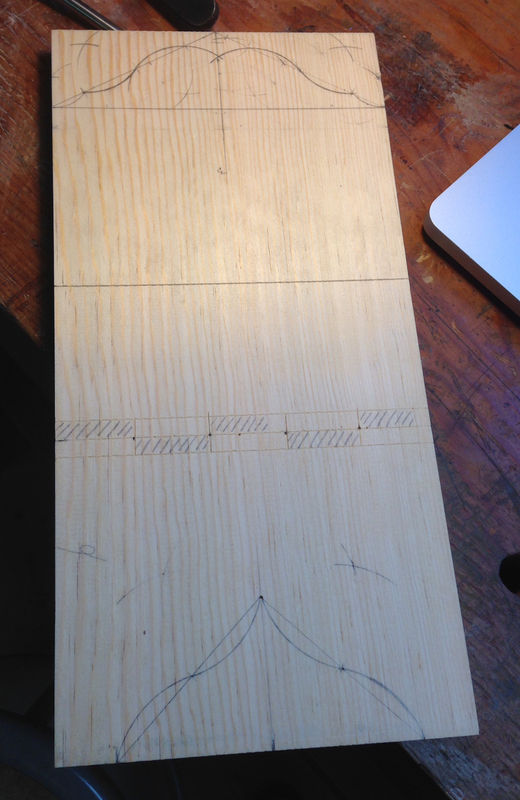 I used the drawing from Roy Underhill’s website, and a 15″ long scrap of 1×8 pine. This drawing, courtesy of the Woodwright’s Shop, is all you need. I did all of the layout first. Laying out the s-curves was an interesting exercise. Prior to building this I did some web searching and came across techniques to layout different kinds of arches. I’ll have to play with that another day. Layout done. I knifed in the critical cuts. Once the layout was done I sawed the profile in the top and bottom, somewhat badly in spots, and proceeded to start chopping the knuckles. I used the scroll saw to cut the separation between the knuckles as my fret saw is too shallow to reach. Profiles sawn, starting to chop the knuckles. What makes this work is the alternating chisel cuts to form the knuckles. Nothing magic about doing this. I could see using a block with a 45 degree angle to make the final paring cuts as perfect s possible, but since this is just a fun piece (and Pine is so forgiving) I just eyeballed it. Before I knew it, all of the knuckles were cut, and I was ready to resaw this to open it up. I expected to have to fuss with this to get it to pop open…or to make a mistake with the ripping and end up with scrap. No such (bad) luck, it opened right up. A little sanding and it’s presentable. I padded on one coat of Blond Shellac, and rubbed it out with some paste wax and that’s it. Simple. Simpler than, say, a pocket-holed cabinet. There are places I could do a better job. I think a narrow rebate plane could be used to clean up any inconsistencies in the knuckles once it’s opened up, as an example. I’d like to use this kind of project as a basis for a carving or inlay project some time in the future. In general, I’m not much of a “practice” guy. Generally I approach stuff by trying a technique, then quickly move to using it in a project. I learned to gas weld by building a roll cage from round steel tubing for my 1973 Firebird. I did one practice joint and beat it with a hammer until I was convinced that it wouldn’t fall apart, then started welding on my car. Dovetails were probably an exception to this. 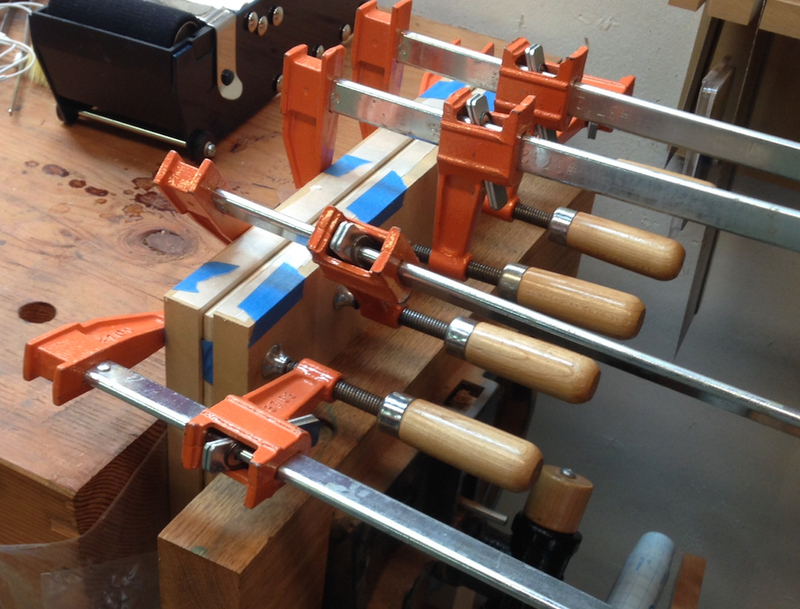 I did some practice joints — that were absolutely terrible — before I made a dovetailed box. 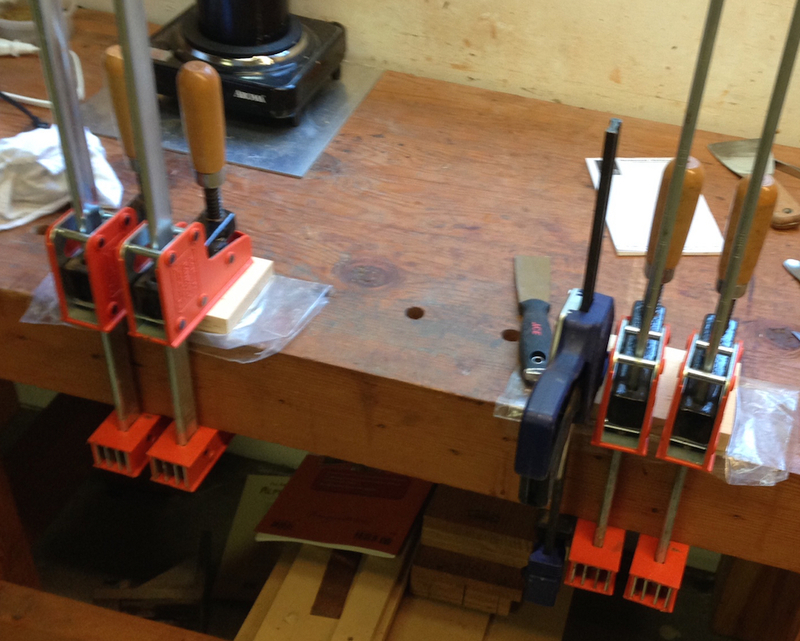 I read something the Christopher Schwarz wrote about doing a dovetail joint every day for 30 days. I made it less than a week before I was feeling discouraged by the pile of kindling accumulating on the floor. 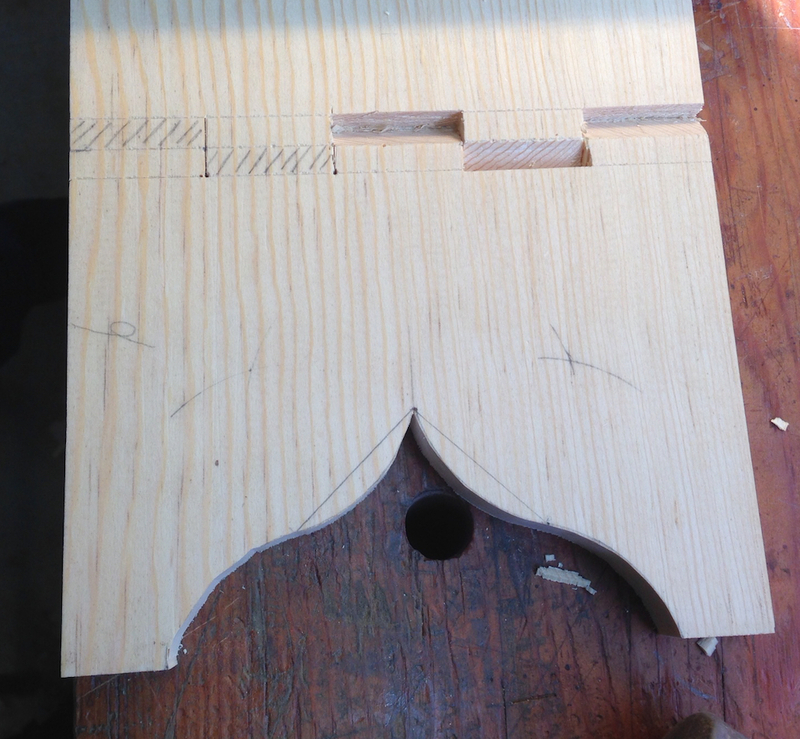 I’ve since gotten competent at dovetailing, although as I type this I wonder if I should go back to practicing. But I digress. Jump in, feet first. So, first off the blades. The blades for the Chevy are longer than both other similar fret saw and scroll saw blades. They are 160mm, and in my (humble and seriously limited) experience are usually 2/0. 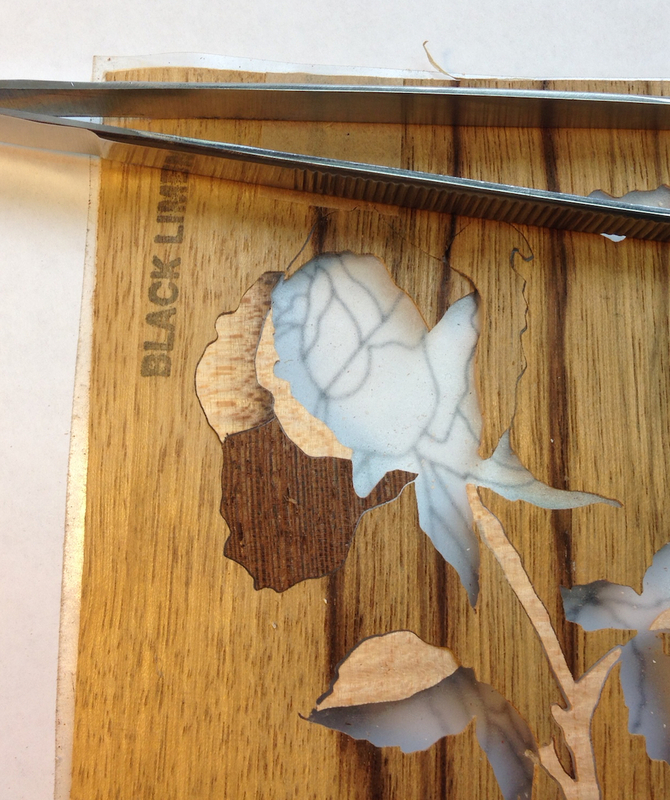 I’ve heard of others using finer blades for marquetry, down to 8/0. I can’t imagine. They are thin, I should have included a pencil line for scale. I’m actually surprised the teeth show up in this picture, I need a magnifier to see them in the shop. 2/0 (“two-ought”) blades for the Chevy. The one on the left is the 72tpi, the one on the right is 32tpi. This photo is about 1.25″ of the blade. In class we used both, and I struggled to cut at all accurately with the coarse tooth blade. It’s the classic tradeoff between speed and control. Both blades seem to leave identical kerfs, but I found that the coarse blade needs a really light touch to be able to saw on the line. Even then, my cuts with this blade were wandering around like a drunken sailor on a moonless night. I did better than in the class, but still not great. Flowers and asymmetrical shapes are really forgiving. No one will notice if a petal is slightly wonked. The picture below is the worst from this project, the rest of the cuts obliterated the line, but weren’t as regular as they should be. With the Boulle technique all the parts are guaranteed to fit. 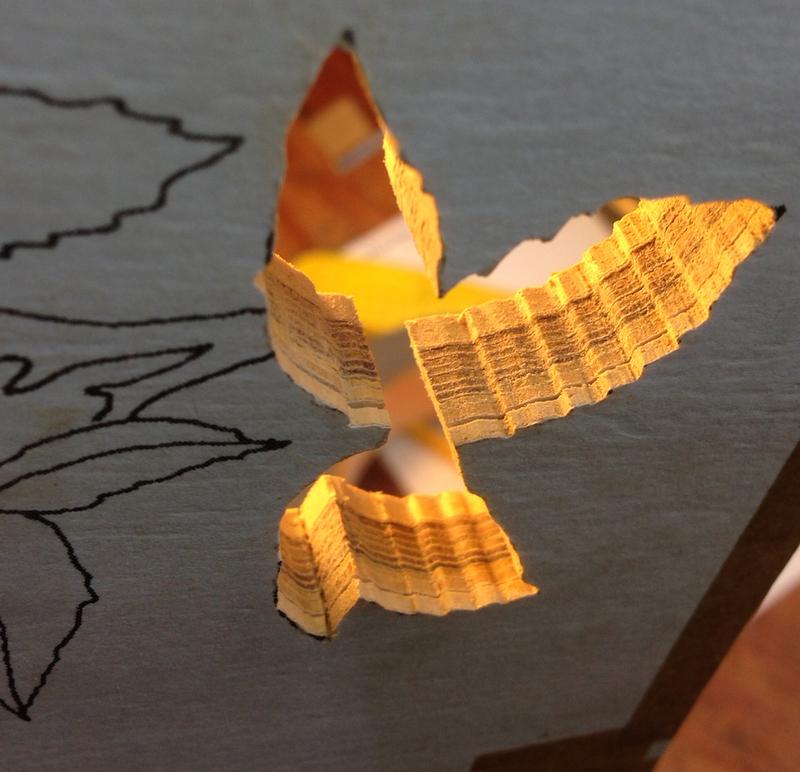 I want to work up to the the “piece-by-piece” method where individual parts are cut, well, individually. I have a ways to go. This is the *worst* of the cuts from this project. A moment of inattention and I’m all over the map. The error here is maybe 1/16″ at the worst. No big deal in this case, but if this was lettering or a regular shape it would be a problem. When I did the last marquetry experiment I used the 72tpi blade as I wanted to be as accurate as I could for the practice. With eight layers of veneer plus the waster veneer on the front and back of the packet it was really slow going. Probably a couple of minutes for each little piece. For the approximately 40 pieces in that picture it was easily three hours of sawing. With this project the (approximately) 40 pieces took maybe 45 minutes to cut. I was just getting in the groove. Granted, there were only four layers of veneer, plus the wasters, in this packet. I’ll have to do a timed comparison that is fair, but suffice it to say it more than twice as fast to use the 32tpi blade. If I can get to smooth, accurate cuts with the 32tpi blade it will be a happy day in the shop. 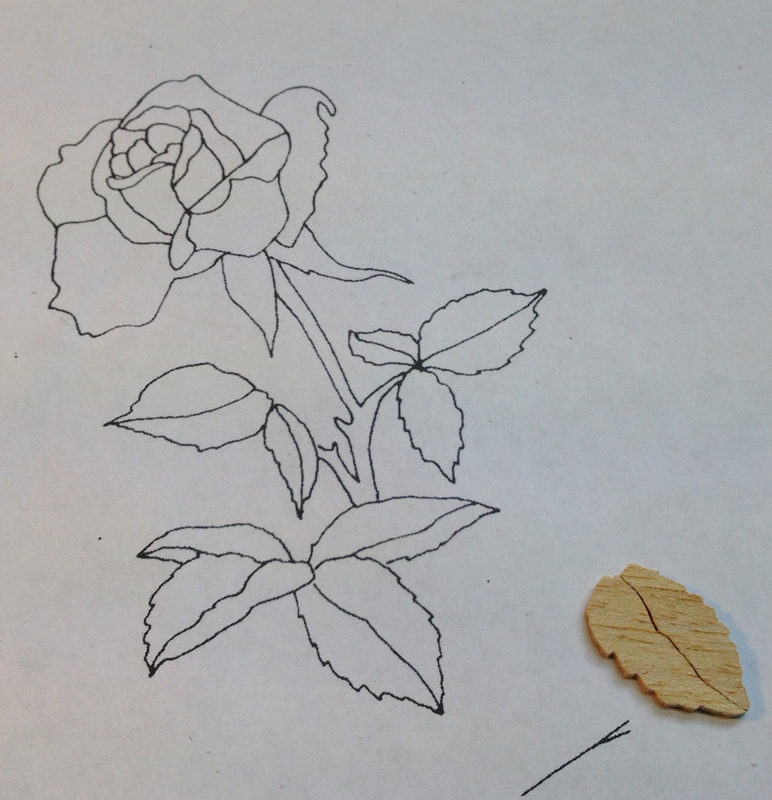 Here are most of the parts of the rosebud laid out for sand shading. After this the pieces were too confusing to know where they went. I’m wasting too much time here shuffling parts. …and the rest of the parts. I’m further along than this, I’ll wrap up the sand shading and assembly in the next post. Then I’ll be designing some practice experiments with pocket hole screws. 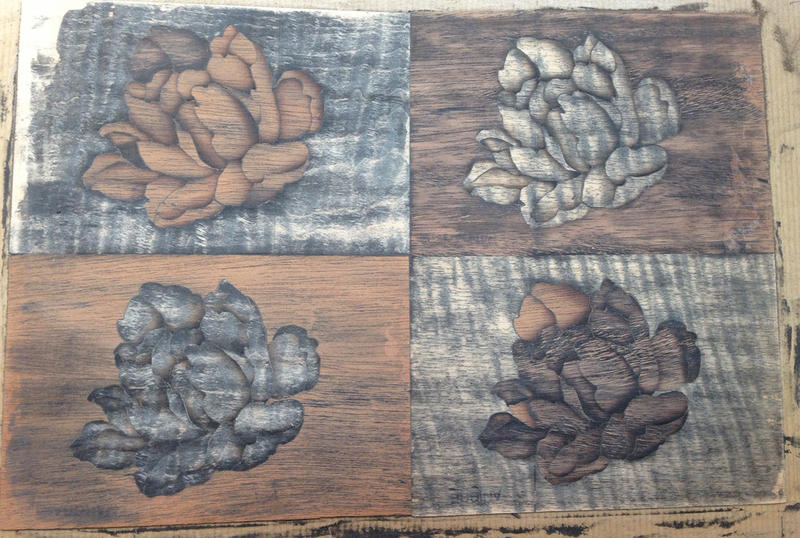 Yesterday I wrapped up my second series of experiments with Marquetry. 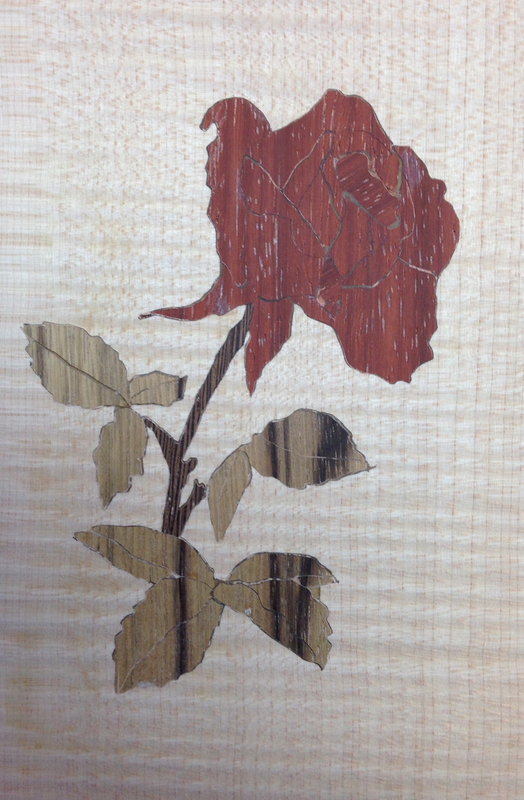 If you’ve been following the last two or three posts you’ll see I’ve been working through some of the marquetry processes using a small rose pattern. For a small design there are a lot of pieces, which can make it a challenge. We left off with the pieces assembled face down on shelf paper, backed with blue tape, the shelf paper removed and the faces bedded in hot hide glue (HHG) on an assembly board covered in special kraft paper. I just pulled the clamps, and this is where we pick up the story. Fresh out of the clamps, we’re looking at the blue tape I used to transfer the picture to the assembly board. See the heavy outline on the left assembly? 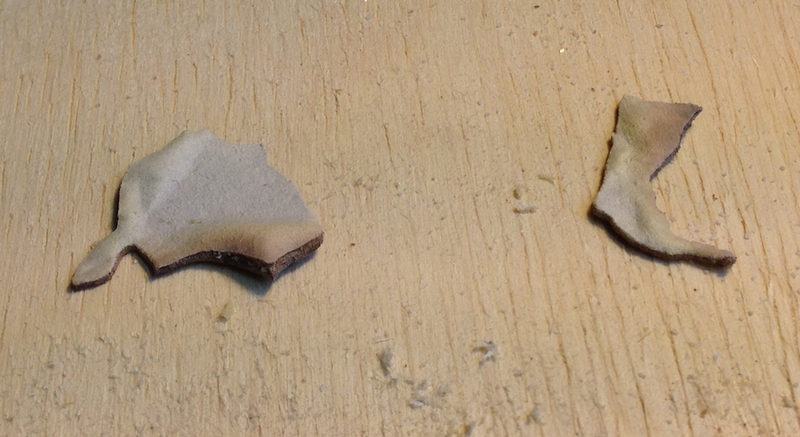 The background is .015″ (measured” thicker than the other pieces. Peeling up the blue taps was concerning, so I went carefully so I could see if it was pulling the image apart. One piece did come up, so I just stuck it back in place with HHG. Tape removed, note one piece lifted. Next, it’s time to add the mastic. I skipped this step the first time around. 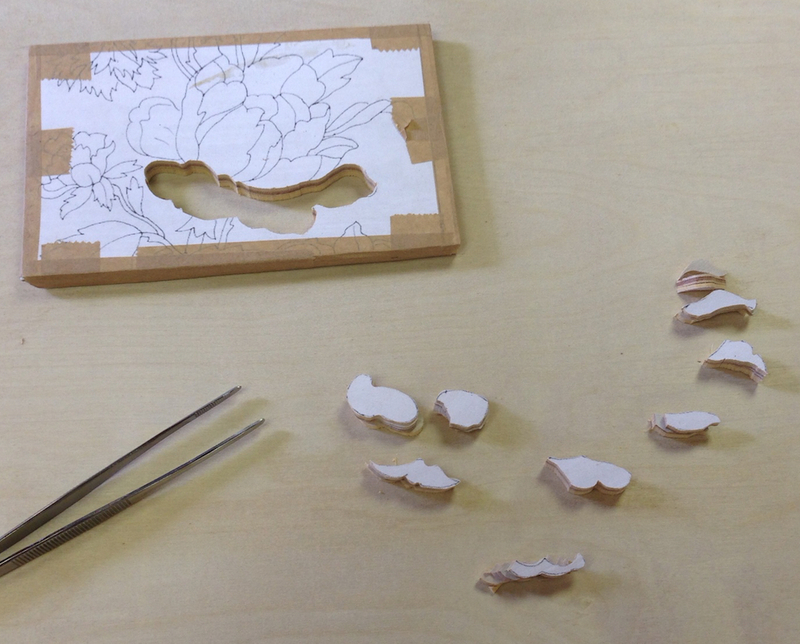 There is a small saw kerf around all the pieces. It’s most noticeable where there are a lot of sawn parts. The mastic is essentially a mix of fine sawdust and diluted HHG. I added a touch of black tempra paint. I made the sawdust by sanding scraps of Walnut. The process is to put maybe a tablespoon of boiling water into a bowl, then take a “brush full” of HHF and swirl it in the water to make a diluted HHG. 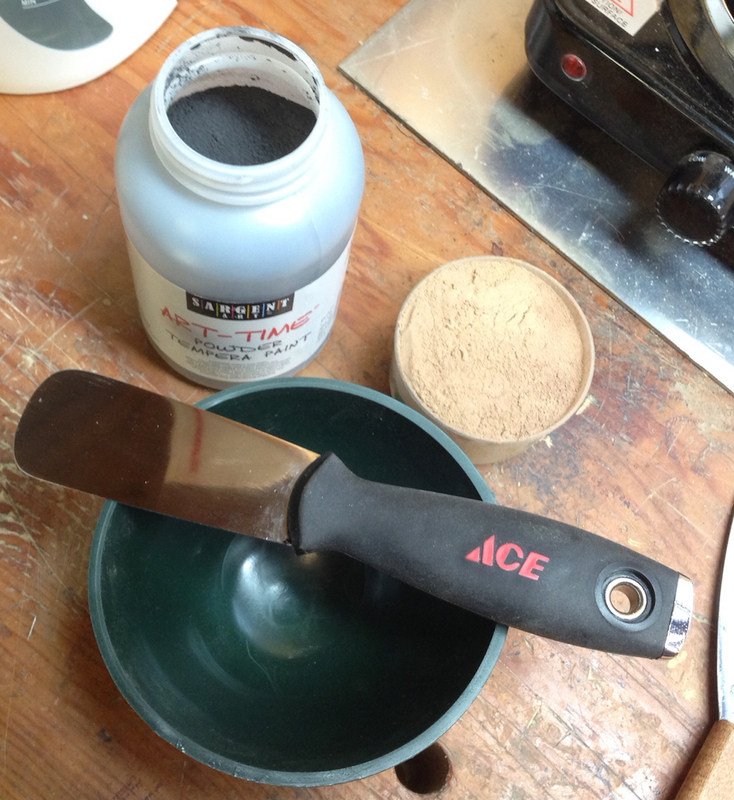 Then spoon a small amount of sawdust and a touch of powdered paint into the diluted glue. Mix. At this stage we’re looking for a puddling like consistency. Then add a bit more sawdust for a thick frosting or spackling-like consistency. Force this into all of the cracks and gaps in the picture and scrape off the excess. In class we used Mahogany sawdust, and Patrick said Cuban Mahogany was the “best” for this. The golden rule in his shop is don’t waste this sawdust. You’ll note that I used the mastic to fill the gigantic thickness difference between the background and the infill veneers on the leftmost image. After the mastic dried for an hour or so I hit it with some sandpaper on a hard block and saw that there were a couple of areas that weren’t filled as well as I wanted. I mixed up a second batch and applied it. 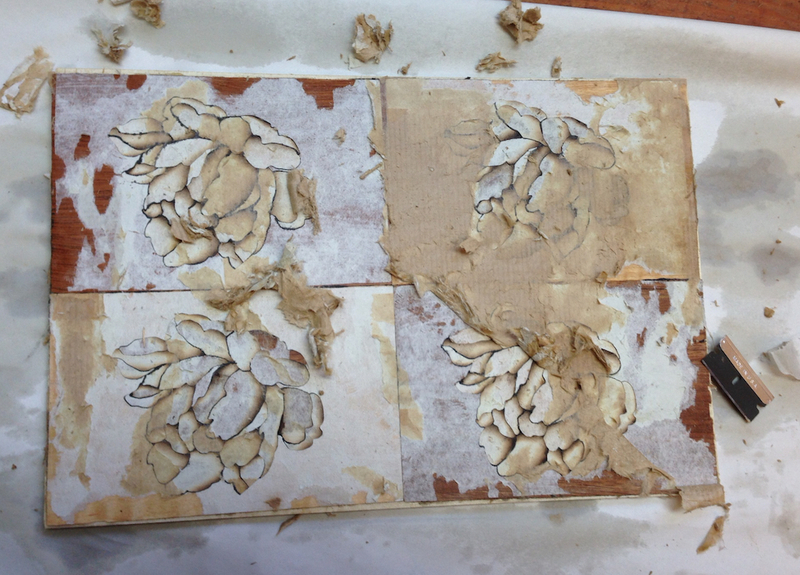 After drying I knocked it down (lightly, just enough to level the mastic with the veneer). Two coats of mastic applied with just a little block sanding. One coat is probably enough, I’m learning still. 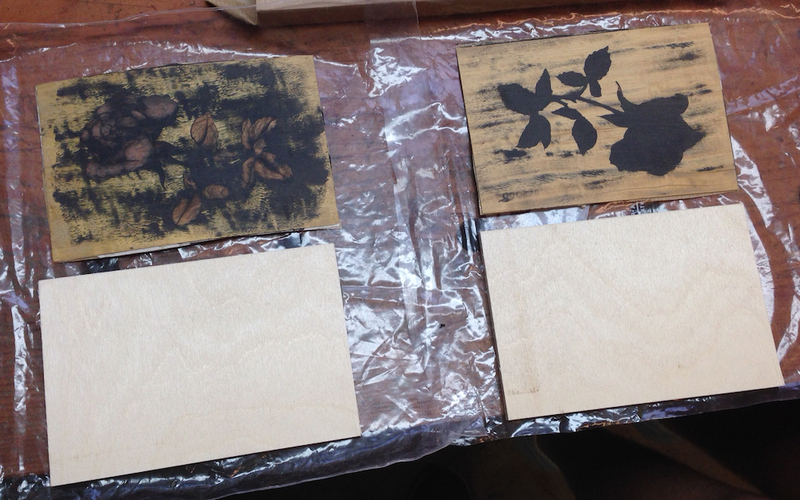 Now I can cut the kraft paper around the images and laminate the mastic-coated side onto a substrate. 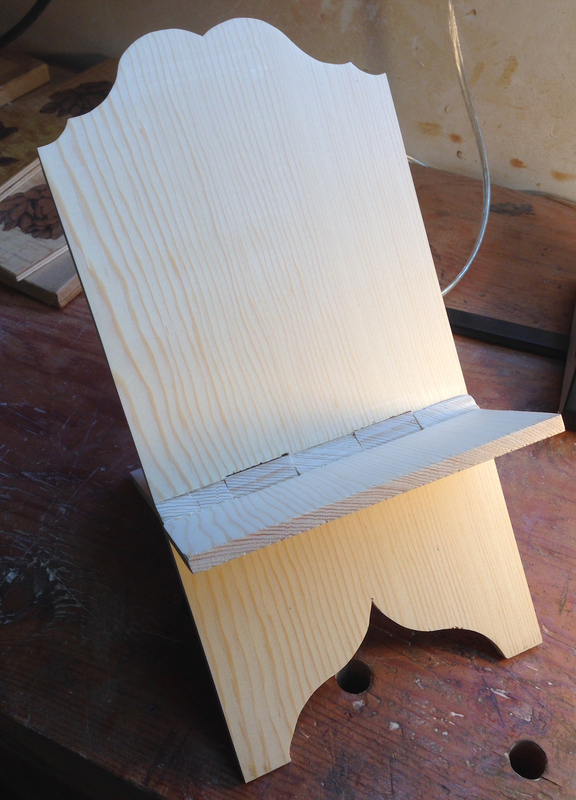 I’m using some cheap 1/4″ “Birch” plywood. 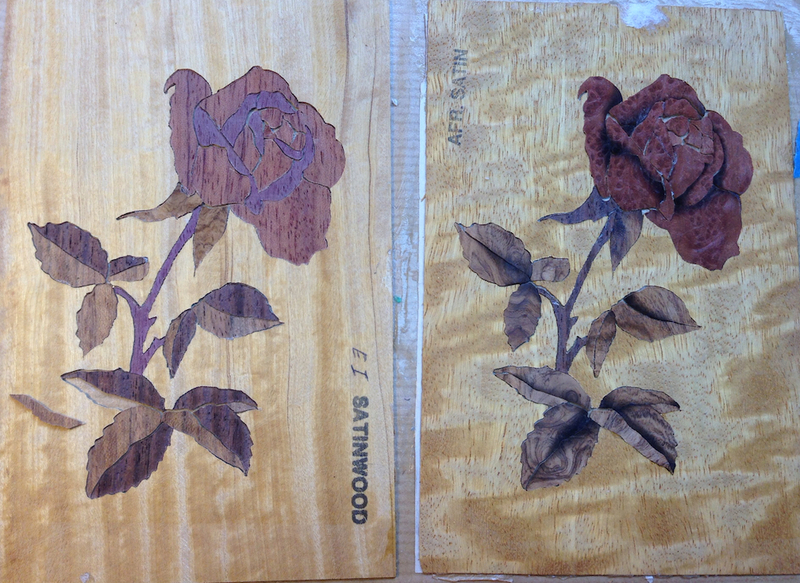 I apply a coat of HHG to both the surface of the plywood and the back of the marquetry. The mastic-coated face is my glue face. I cover them in plastic add a caul and some clamps. 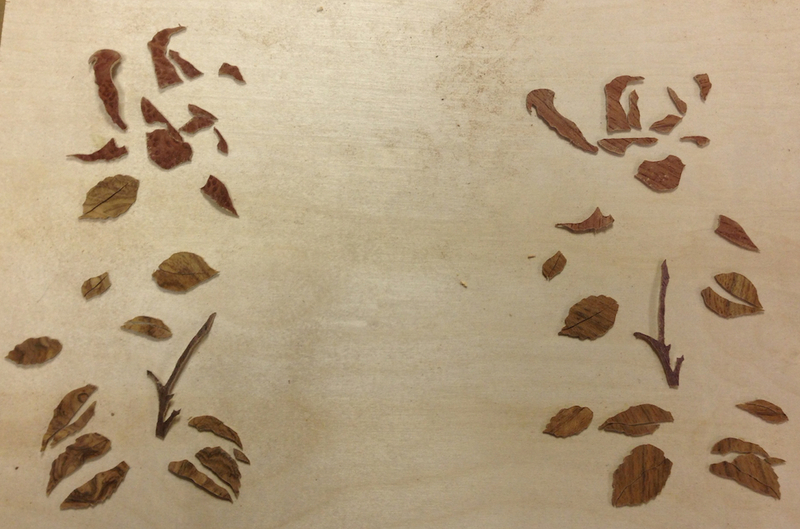 Side note, I need to make a veneer press soon, this dance with the clamps isn’t going to work for a larger image. 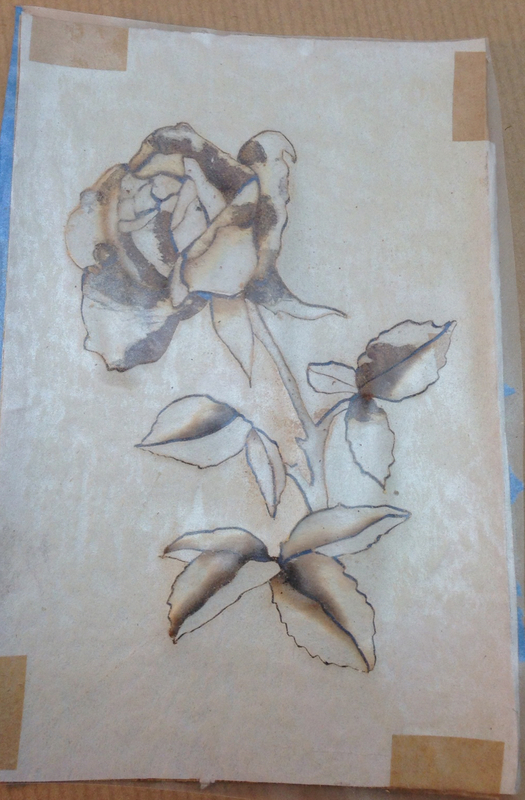 I scuffed the paper with sand paper, and sprayed it with water. This step makes me nervous. The glue is water soluble. The idea is to get the paper wet enough to scrape off, without getting the glue in the mastic or under the veneer too wet. I didn’t take any pictured during the scraping process as my hands were full of paper mache. It seems to take about 3 rounds of wetting and scraping to do the job. The first round gets most of the Kraft paper, the second round gets most of the newsprint that was laminated to the veneer for reinforcement. The last round gets the little bits that remain. One more round of water and a scrub with a scotchbrite gets any glue residue. I like the sand shaded image better than the mixed colors — at least on the rosebud part. I’m not sure where I’m going next with this. I need more practice on sawing accurately. A small project with scrolls or letters would probably help with that. I need more practice sand shading — but maybe with a slightly thicker veneer and slightly larger parts would be a good idea. 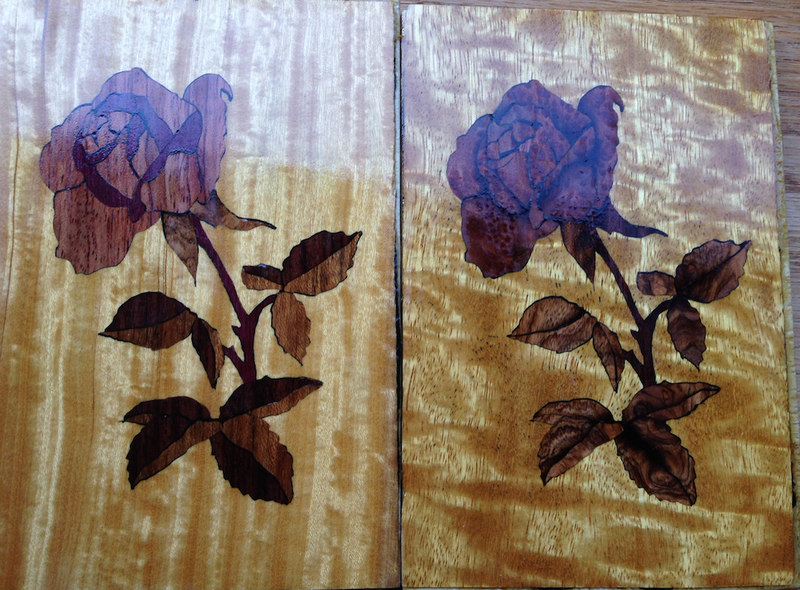 I also want to plan a project that will incorporate the marquetry picture rather than just do practice pieces. All of which to say, I’m not sure what I’m going to do next. It’s certainly going to involve buying veneer as I’m running out of options with my veneer sample pack. 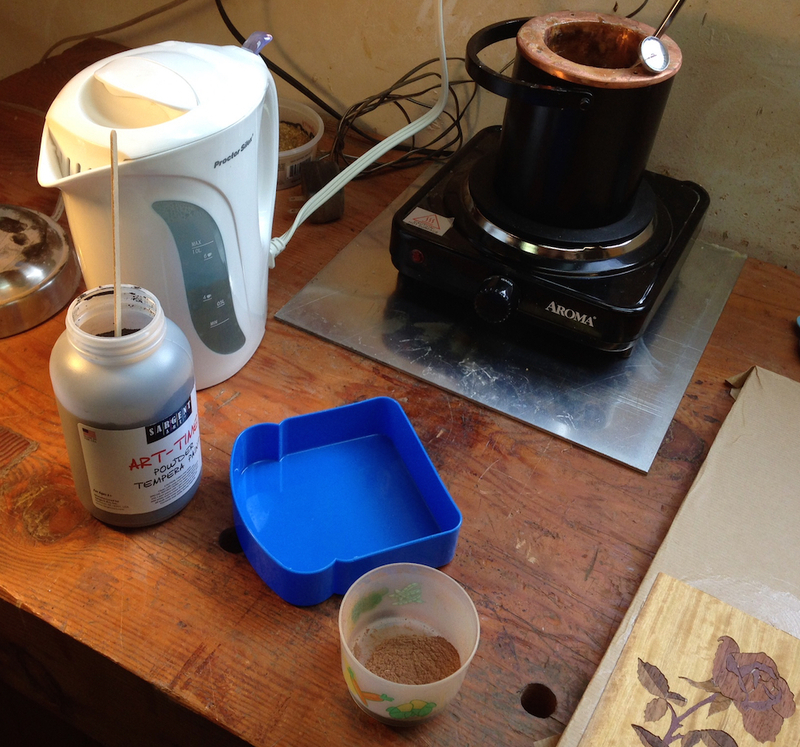 I got my new 1,500 watt hot plate yesterday and fired it up to try sand shading marquetry again. By the way, I’m buying all kinds of weird stuff for marquetry. Usually when I think about woodworking tools I need (want) it’s backsaws, handplanes, chisels and that sort of thing. Or power tools. “It would be really handy to have a spindle sander to do this” or “I bet I could fit a router table over there”. Instead I’ve been getting packages with hot plates, hot water kettles, gummed tape dispensers and tweezers. Who buys tweezers to do woodworking? Me, as it turns out. I used the low-tac shelf paper to pre-assemble the parts for two flowers. 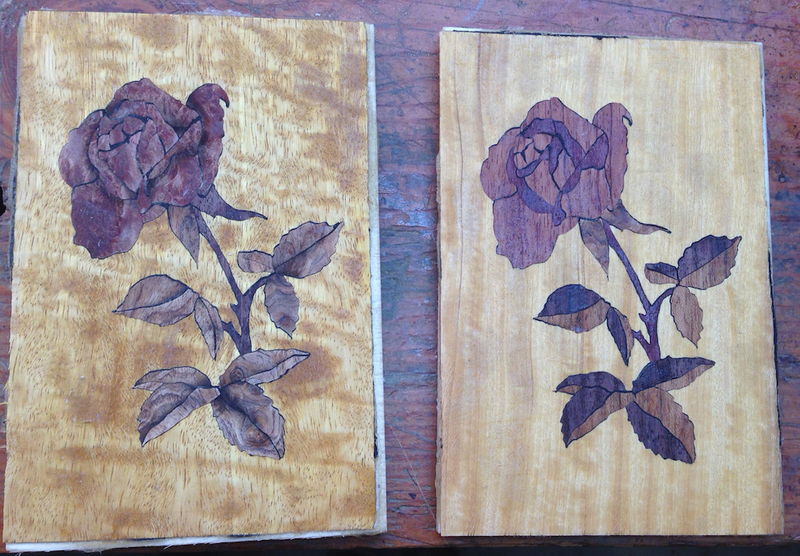 The first one uses Redwood Burl for the flower. 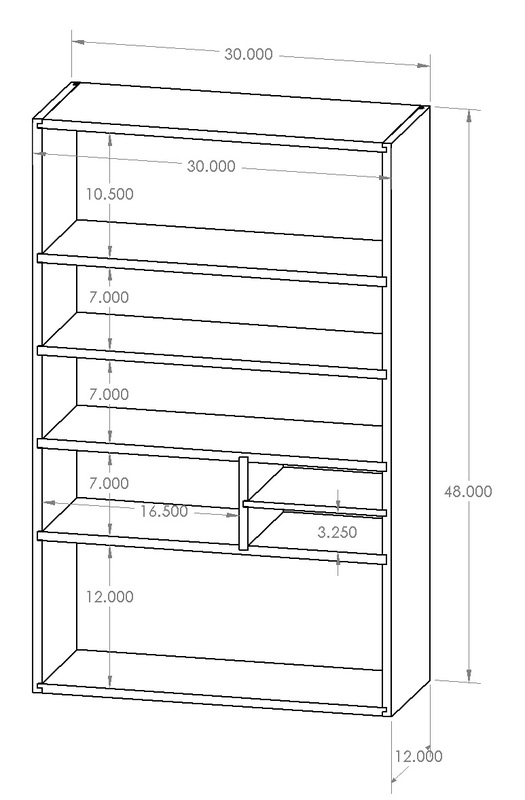 I measured it before assembling the packet. 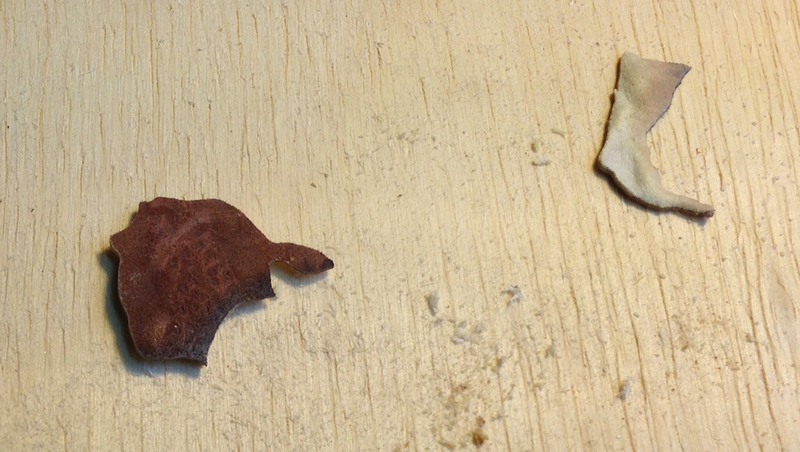 Most of the veneers were .020″ to .025″ thick, this one was .014″. That a lot thinner. The veneer thickness is a major annoyance for me. I need to get to where the material I’m using is all the same thickness at least. 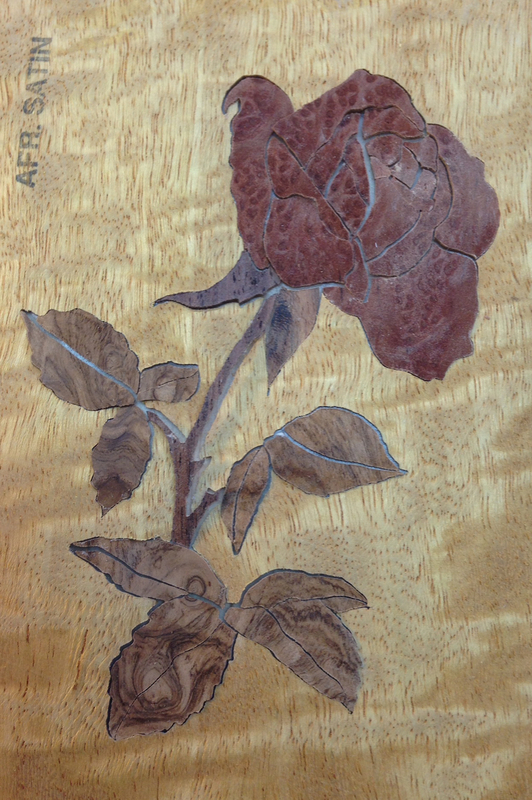 While I was assembling I did the second image, this one uses Bubinga for the rose. Both roses assembled. Redwood Burl on the left, Bubinga on the right. Then I started sand shading the parts of the left image. 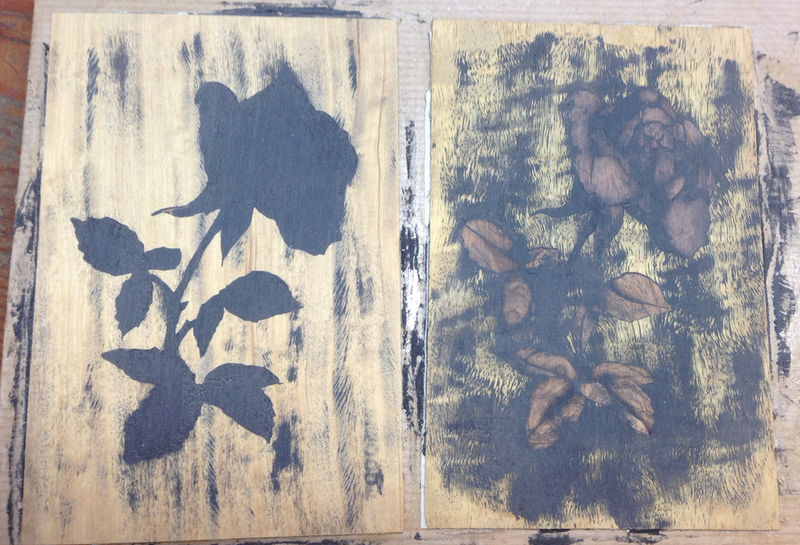 The leaves went OK, but the pieces of the rosebud didn’t work well. The heat from the sand seemed to make the warping of the pieces worse. 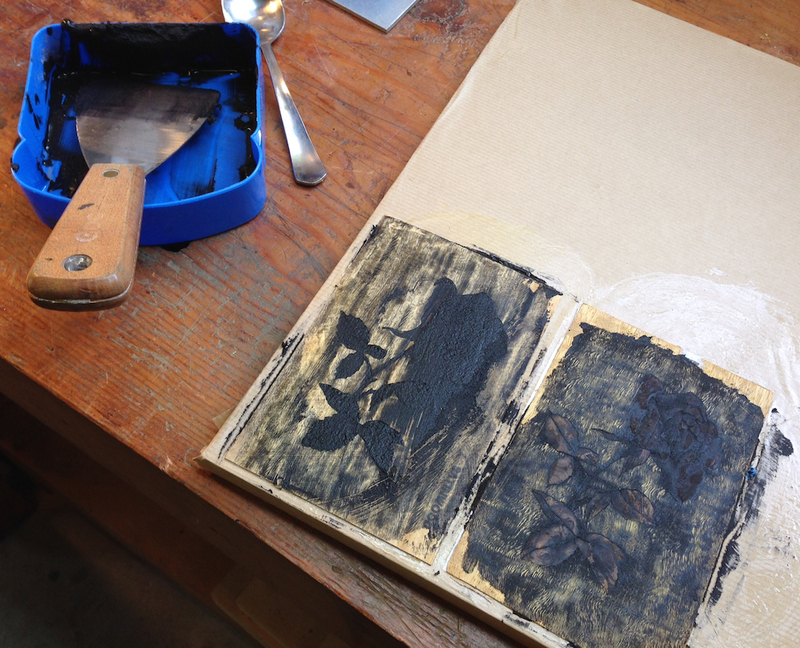 A bigger problem was that the newsprint I applied to the back of the veneer would bubble up. Back of two pieces of the Redwood Burl rosebud showing the bubbled backing paper. As you can probably imagine, these bubbled wreak havoc with the assembly. So after sand shading each piece I had to use a knife to scrape away the bubbled area before I could put it back in the picture. 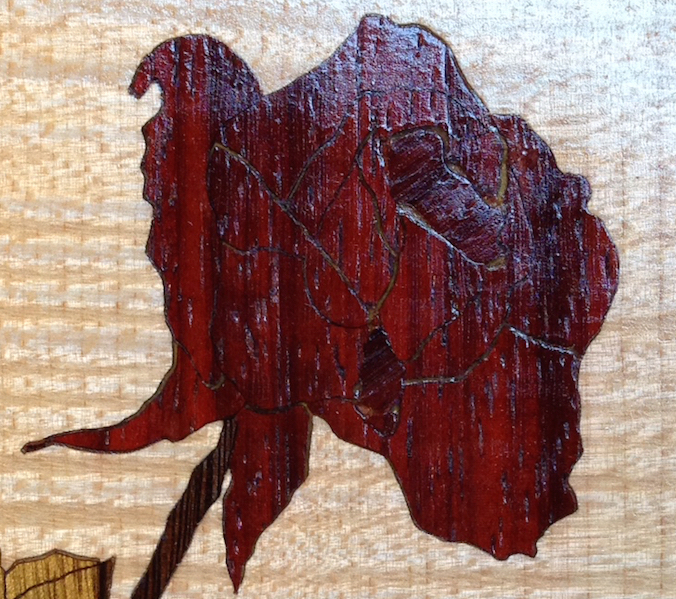 The other side of the same piece of the rosebud showing the extent of scorch on the veneer. 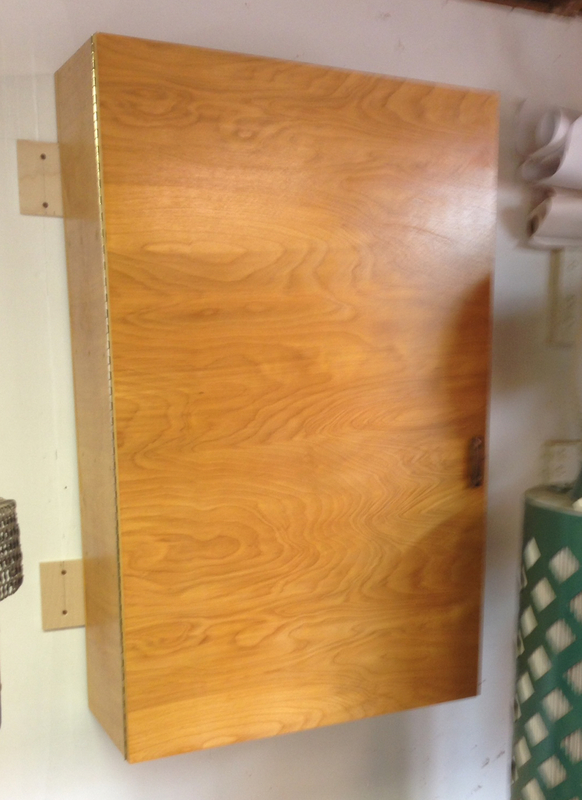 Long story short, I think the Redwood Burl, at .014″ thick, was too thin to really sand shade. Maybe if it was doubled up to two thicknesses it would work better. I’m not completely sure why the backing newsprint was bubbling up. It did it on the leaves too, but not quite as severely. Doing the final pre-assembly of the Redwood rose was a real pain. The contact paper had lost some adhesion, the parts were curled from being so thin and the ones I sand shaded had an uneven surface. Every time I moved a piece two others would pop out. That was fun, let me tell you. I didn’t even try to take a picture, I had eight fingers holding pieces in place while I tried to position little pieces of blue tape to lock everything together. Crazy. Eventually I got all of the pieces in the first image locked into place with blue tape. 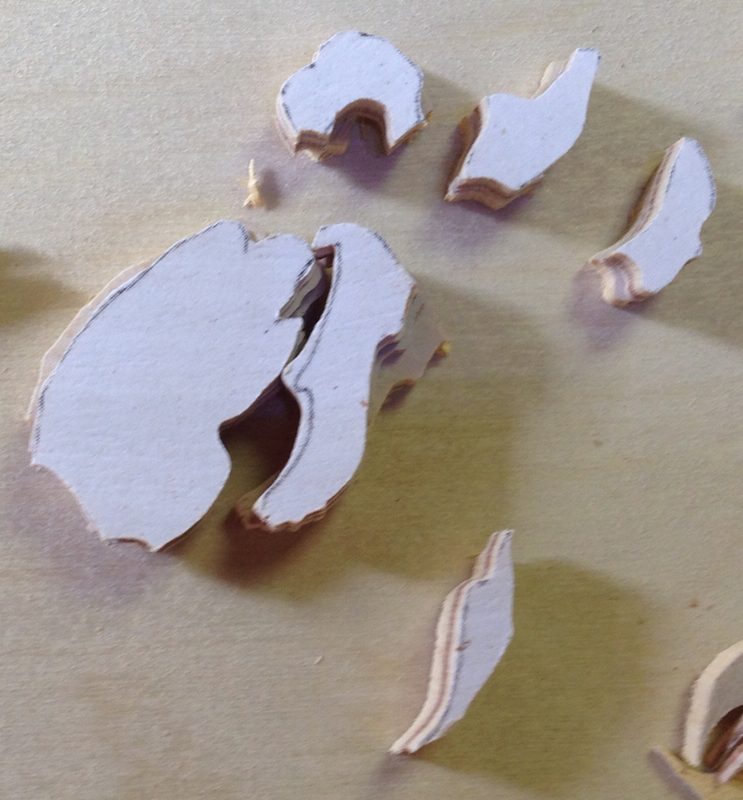 I cut the shelf paper loose from the board and flipped it over. It’s hard to see much beyond the charred bits of newsprint. For the second image I decided to try something different. I picked out contrasting colors from my extra parts and swapped out pieces in the image. 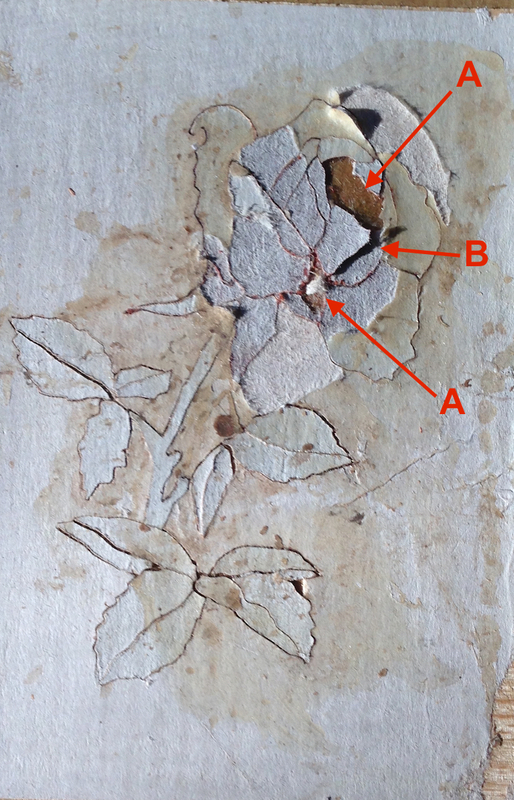 Note the half of the leaf pieces and some of the rose pieces are now a different species. 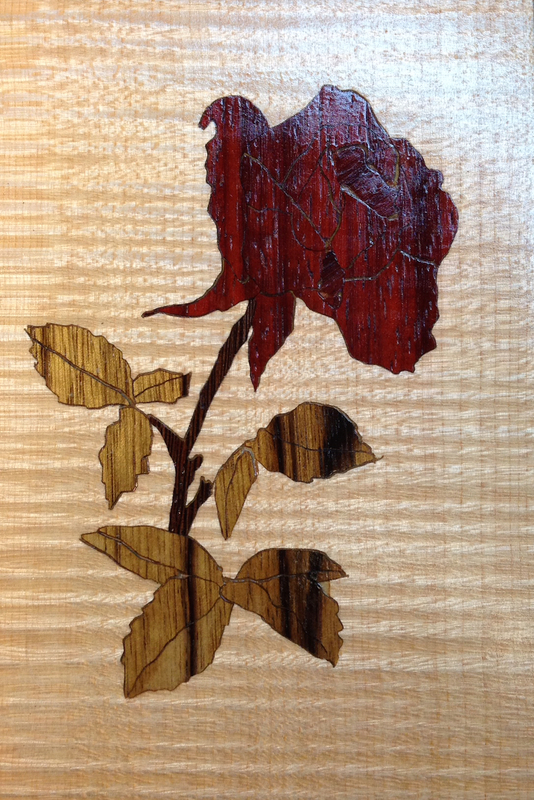 This rose is mainly in Bubinga with some Purpleheart pieces swapped in. Second image — no sand shading but different colored pieces swapped in. This image is going to present some other problems. 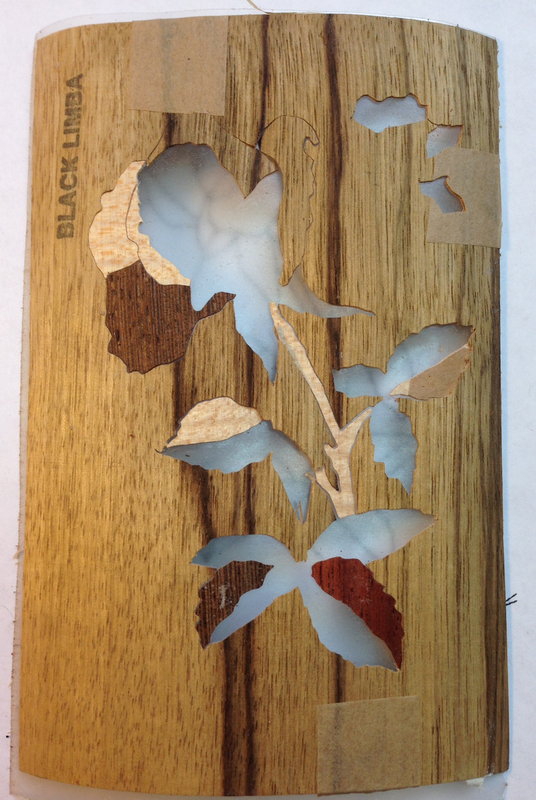 The background veneer is about .040″ thick, and the other pieces are all around .025″. This is the problem with using mix-n-match veneer from my sample box I guess. 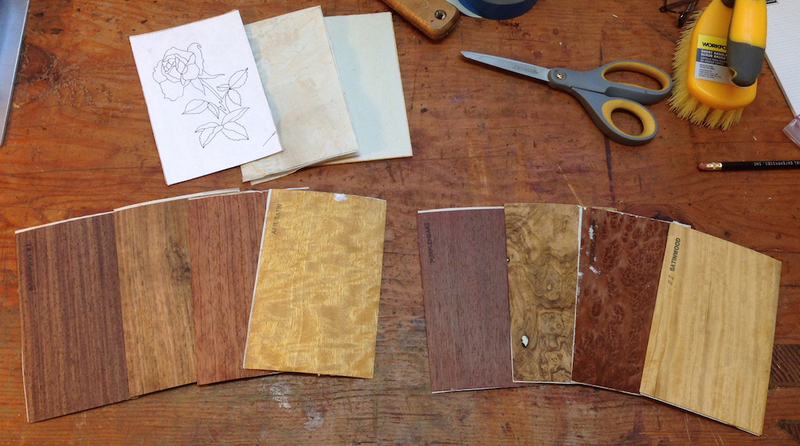 I bought some imported dyed veneer before the holidays that should be (fingers crossed) more consistent. Not thicker, just all the same. 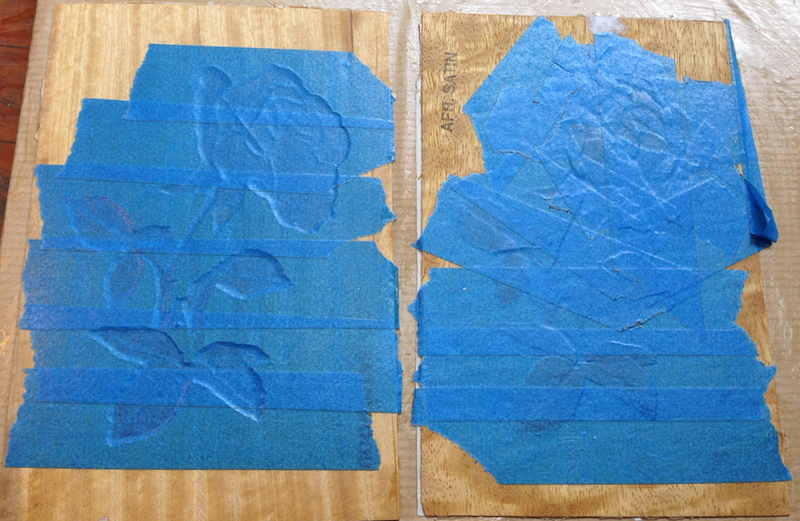 Once this second image was pre-assembled I locked it together with blue tape, and cut it loose from the board. 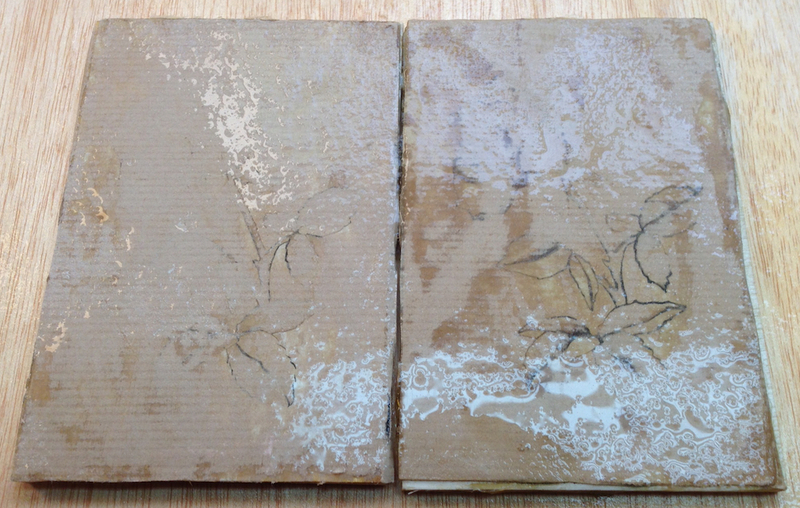 Then I carefully peeled the shelf paper off the two images, and bedded them in hot hide glue on the final kraft-paper-covered assembly board. 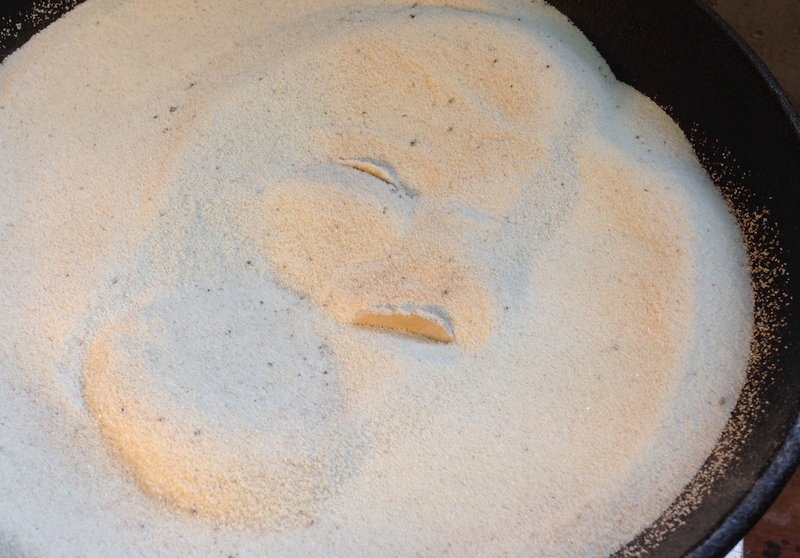 The newsprint (show face) goes face down in the glue. I covered these with a plastic film to keep the glue from sticking to the cauls, a couple of layers of cloth to help get clamping pressure to the thinner veneers and a caul. 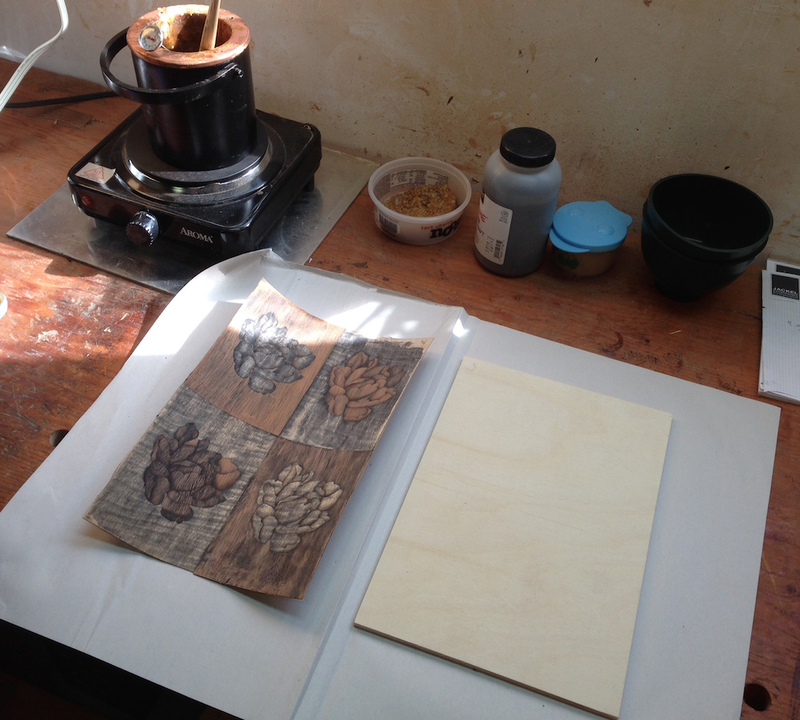 I’m going to need to make a proper veneer press soon if I keep doing this. Later today I’ll unclamp my mess and experiment with applying the mastic to fill the saw kerfs. 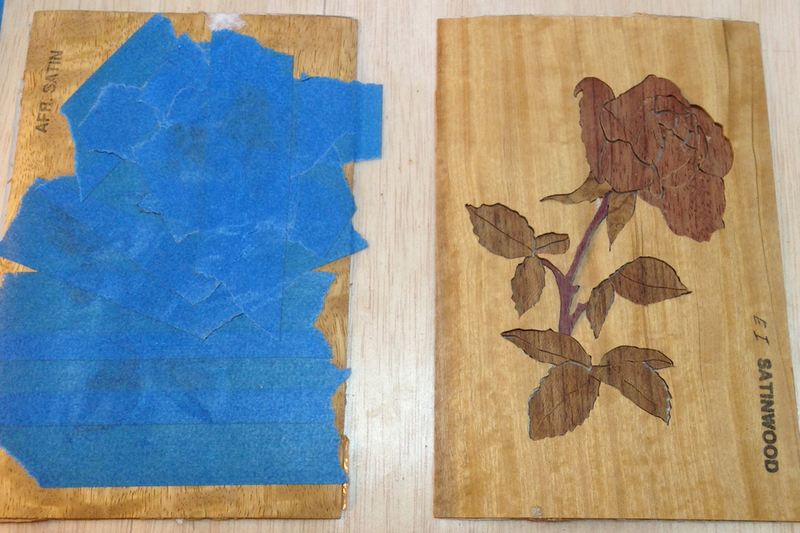 And then maybe I’ll open up the dyed veneer and do another image. I sawed out the rest of the parts for the small rosebud motif I’m doing as my practice exercise, and I’m ready to face my assembly demons. More or less. The main assembly problem I had was with the hot hide glue (HHG) “going off” way too early. I may have had to HHG a touch too thick. Patrick did a really great tutorial on “animal protein glues” in the class, and he said pretty clearly that the water carries the heat in the glue. It was also fairly cool in the shop. So I decided to use some training wheels. 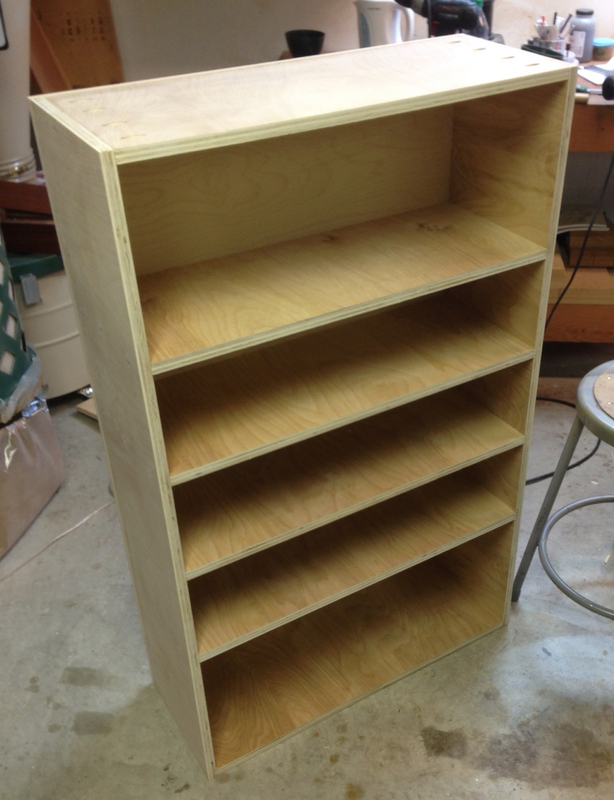 I’d seen Paul (Shipwright) on LumberJocks use clear shelf paper as an intermediate step in assembling his projects. He’s been doing some really amazing work, so I picked up a roll at the hardware store. I rented a house when I was in college that had the kitchen counters “refinished” with shelf paper. I tried to remove it because it was hideous, but it had bonded on some sub-atomic level and it was going to require toxic chemicals and haz-mat suites to get it off. So, I wasn’t sure how this would work. Turn out, it works like a charm. This clear shelf paper has a low-tac adhesive, it’s less sticky than blue tape. I can position pieces on it, remove them, and put them back. Eventually this will need to be glued down to an assembly board covered in the French ribbed Kraft paper using HHG. Remember, the flip side has newsprint laminated to it. It’s the newsprint side that will be bedded in the HHG. 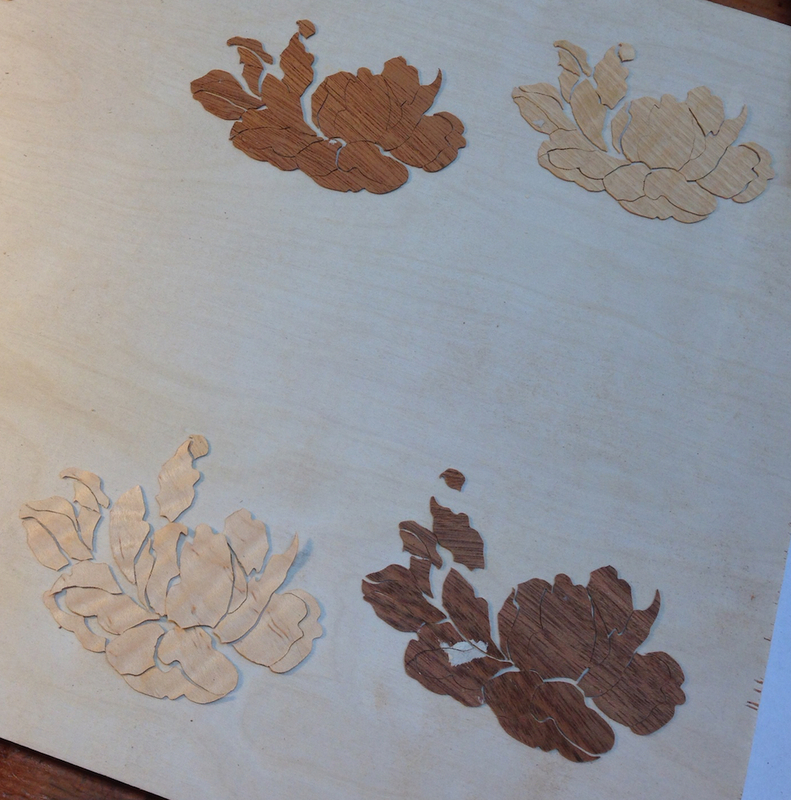 So, to be able to trial assemble the project seeing the veneer colors I have things backwards. I’ll need to cover the front with blue tape when I’m ready to glue to the assembly board, then remove the shelf paper. 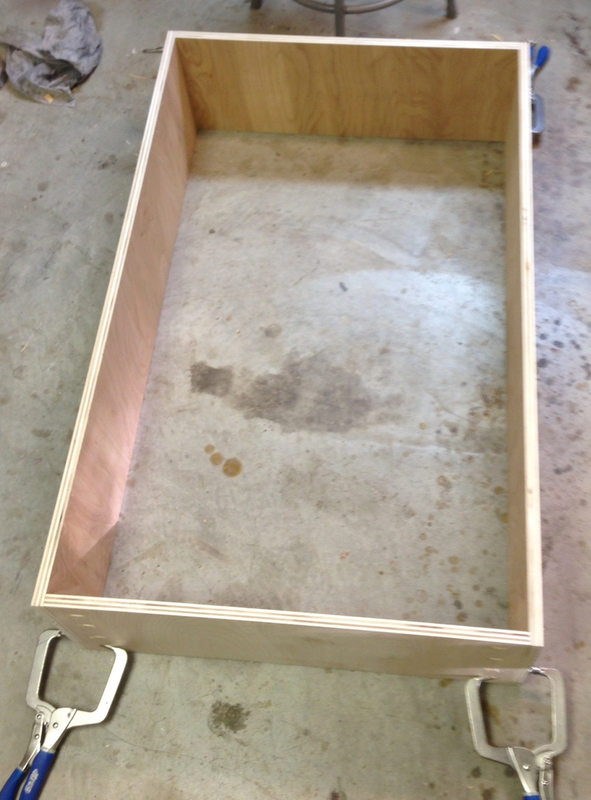 Once it’s glued down to the assembly board I can fill the seams with mastic. Then it gets cut free and flipped over to glue down to the actual substrate. Good grief, it’s no surprise I got confused last time. I’m confused now. Shelf paper stuck to the newsprint-covered face side of the background veneer. Fit all of the parts in place to ensure they are all accounted for. 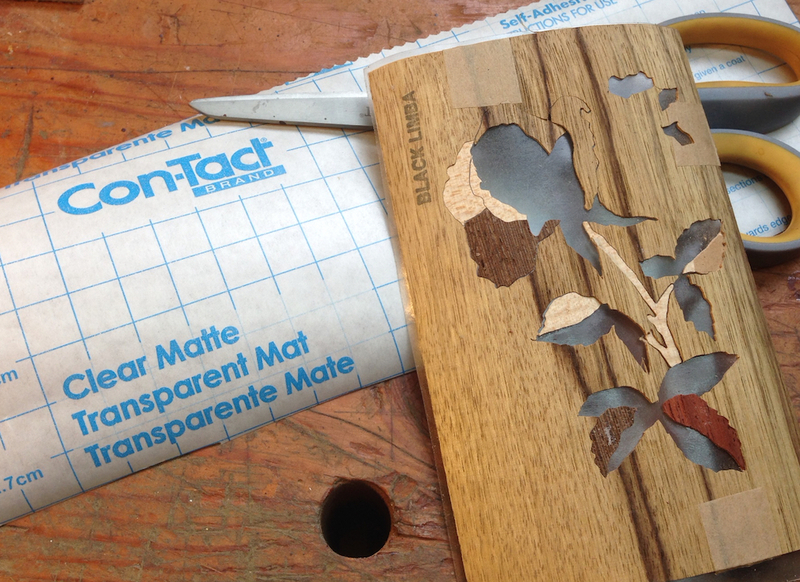 After the glue up is cured, mix the mastic and force into any gaps in the marquetry with a putty knife. 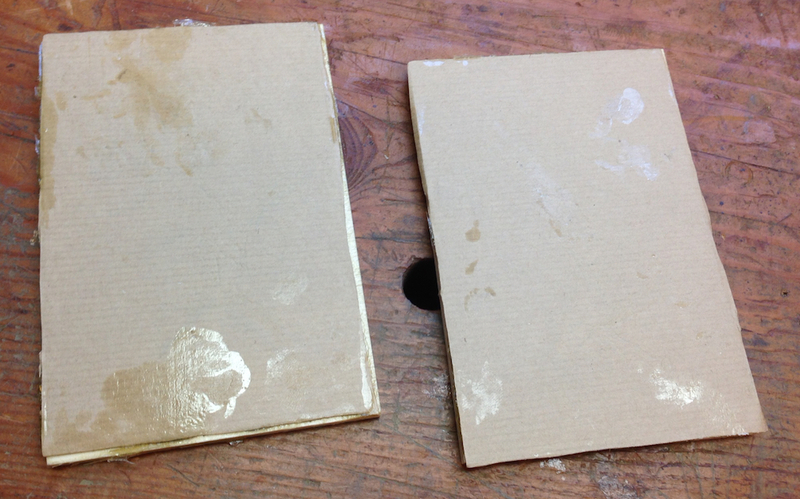 After the mastic has dried, cut the veneer picture free from the board by cutting the Kraft paper around the edge. Glue the picture to the final substrate on the project with the paper side up. Once this final glue up is dry, wet the Kraft paper with a sponge and scrape the paper off. It seems like a lot of steps, but in class it was simple and went pretty quickly. I just need to practice a bit. The main reason I want to do these extra steps with the shelf paper and tape are to buy myself some extra time to go the assembly. But the other reason is so I can do the sand shading, and see how it affects the picture as I go. So, sand shading. Should be pretty simple, as long as I don’t turn any of the pieces into tiny thin charcoal briquettes. I decided I’d best do a practice run at this. 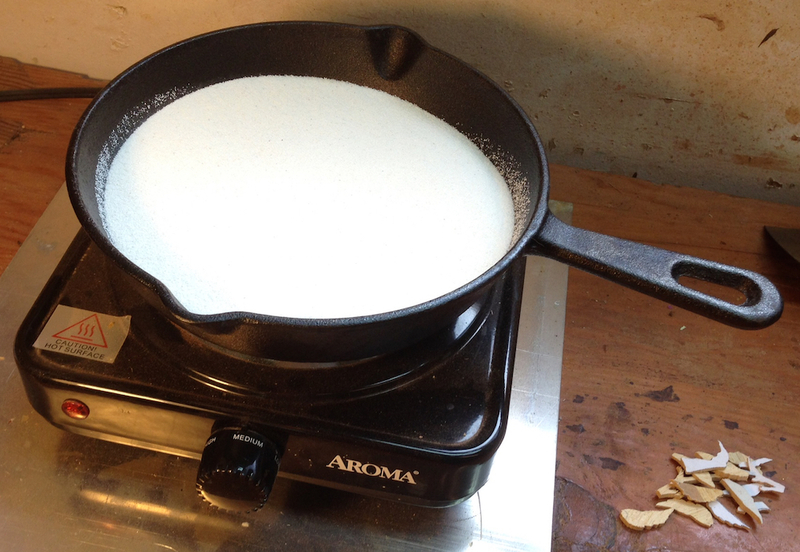 I have a small cast iron pan that I don’t use to cook — it came as a set of 3 from Kmart last year. 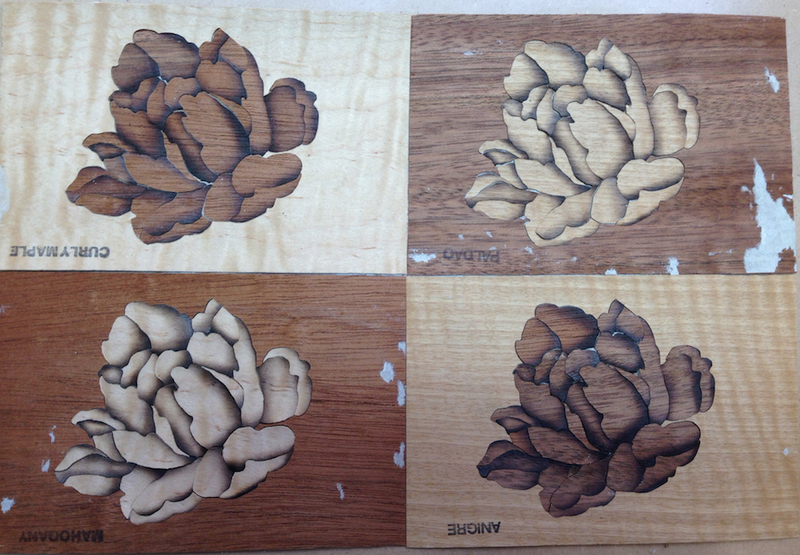 I use the large one and the small one in the kitchen, but the middle has just become a marquetry tool. I filled it with “reptile sand”, which is just very fine sand. I put it on my $19 hot plate that I use for heating glue (and warming pieces of glass for foiling when doing stained glass). Sand shading setup. Don’t use this model of hot plate, it’s not hot enough. I cranked up the heat to the max, and tried scorching some scraps of veneer. 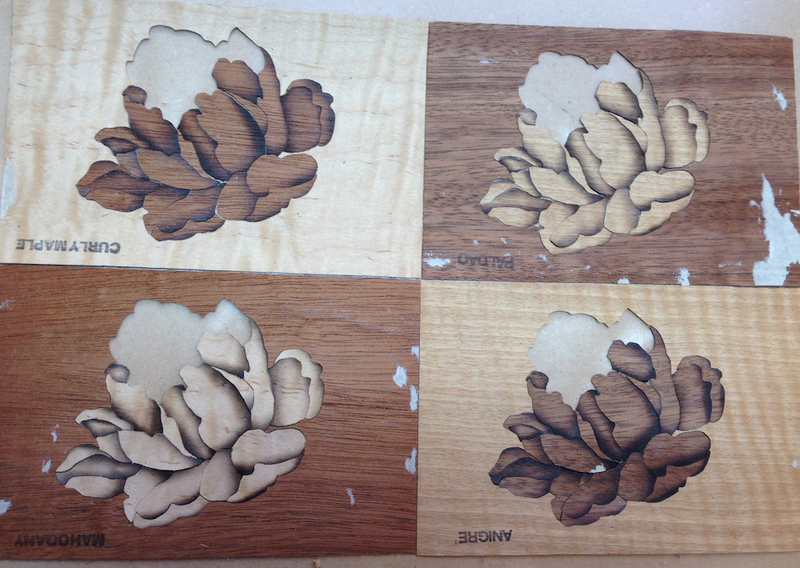 I started with the pieces from the “waster” veneer on the front and back of the packet. 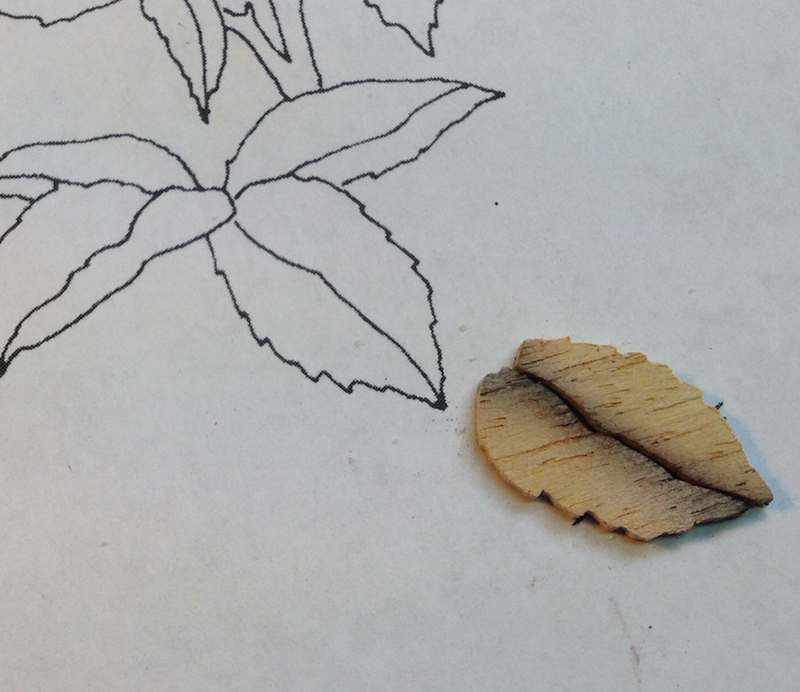 In this example I have two pieces that together are a leaf in the pattern. 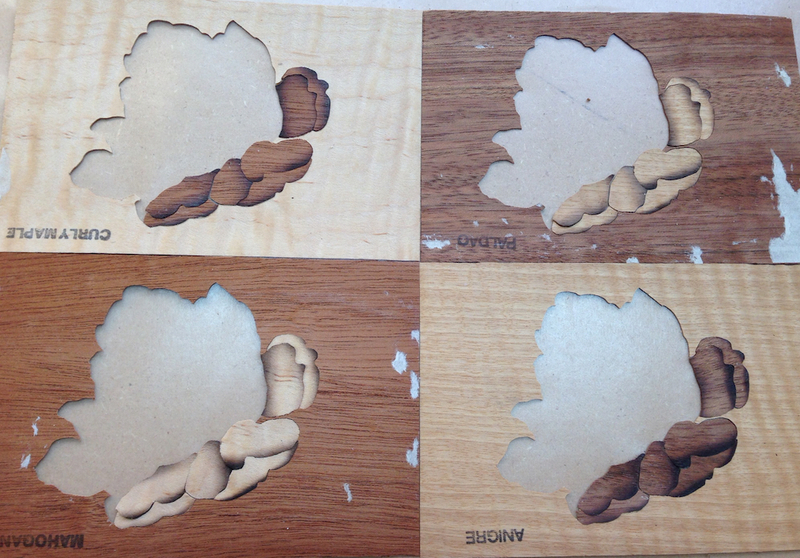 Sand shading test using the 1.5mm thick “waster” veneer. I checked at 5 seconds, nothing. 20 seconds…nada. Around 40 seconds there was a little color. I had to put them all the way to the bottom of the pan and wait another minute to get a reasonable amount of shading. It seemed like the shading was waaaay too slow, even given that this was using thicker scraps. I watched a YouTube video, and they were getting shading in a matter of a couple of seconds. In fact, on some parts they scooped up a teaspoon of sand and poured if over the tip of a small part and got shading. Long story short, I need a hotter hot plate. One thread I read on the ASFM site said that a 1,500 watt plate was what they used at the school. We didn’t cover sand shading in the class, so I’m taking it on faith. I ordered a $29 hot plate that is rated at 1,500 watts. When it arrives I’ll repeat my experiment and hopefully will have better results. What I have works, it’s just too slow, it ends up baking the whole piece to get a little color. 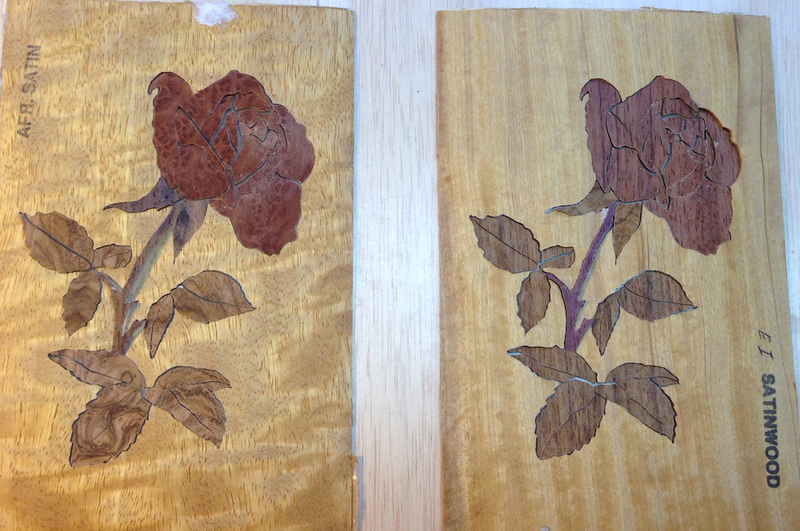 I decided to repeat the Rose pattern I did in marquetry last week again for practice. With a few changes. There were a couple of problems with the first attempt. The main issue was with the assembly. Things got out of control due to the hot hide glue (HHG) drying faster than I could assemble the picture. I intentionally skipped the sand shading step, which on this piece I think really would have added a lot. The rose bud itself has something like 21 little pieces, but once it’s re-assembled it just looks like one big red blob. If it had been shaded you would have been able to see each little petal. Instead, you can see the two pieces I patch in and the uneven gaps, but otherwise it’s homogenous. 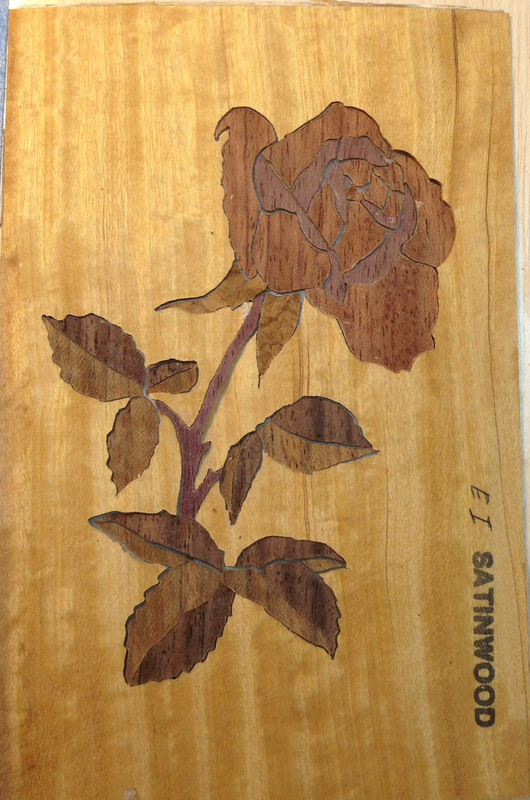 Rose #1, notice how all of the pieces run together and are indistinguishable. There are a couple of things that could be done to add contrast to the rose bud next time. One is to sand shade the edges as I’ve mentioned. Another would be to assemble the rose using multiple colors. 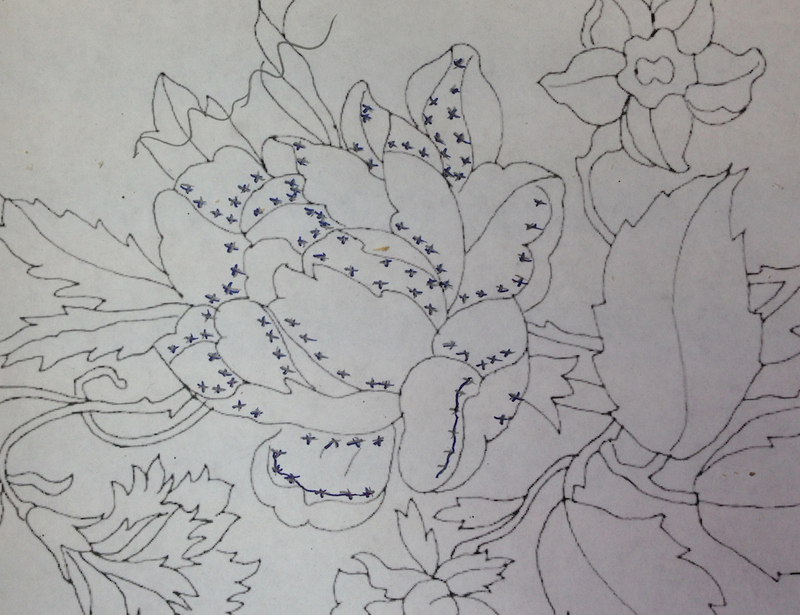 The marquetry process I’m using is typically Boulle, named after Andre-Charles Boulle, a famous French cabinetmaker in 18th century Paris who wasn’t actually French. 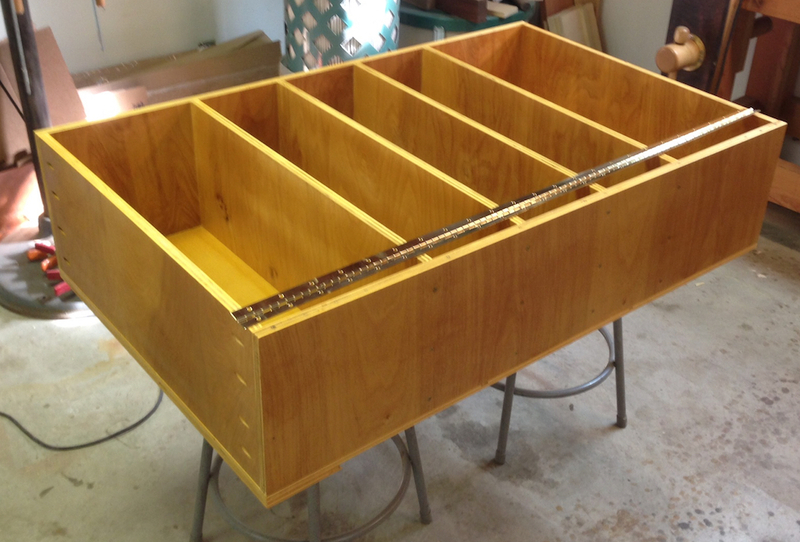 The process involves creating a stack of all of the veneers to be used in the finished composition and sawing out all of the elements from the one stack. So for this round of practice I’m changing a couple of things. First, I’m using twice as many layers in my veneer stack. This is part of an experiment to see if I can produce two good positive images from one stack. I plan to try sand shading on these pieces. 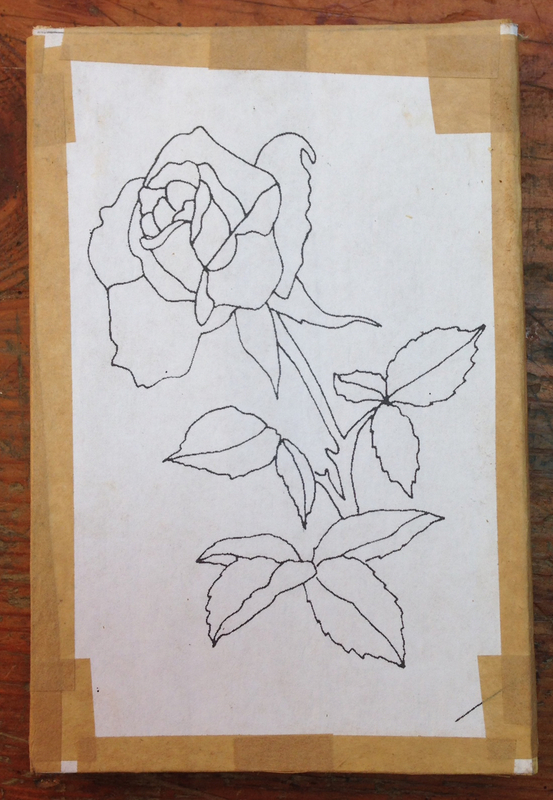 I’ll also have enough extra pieces to assemble some negative images of the same picture — I’ll use these to experiment with mixing colors to get the contrast in the rose. 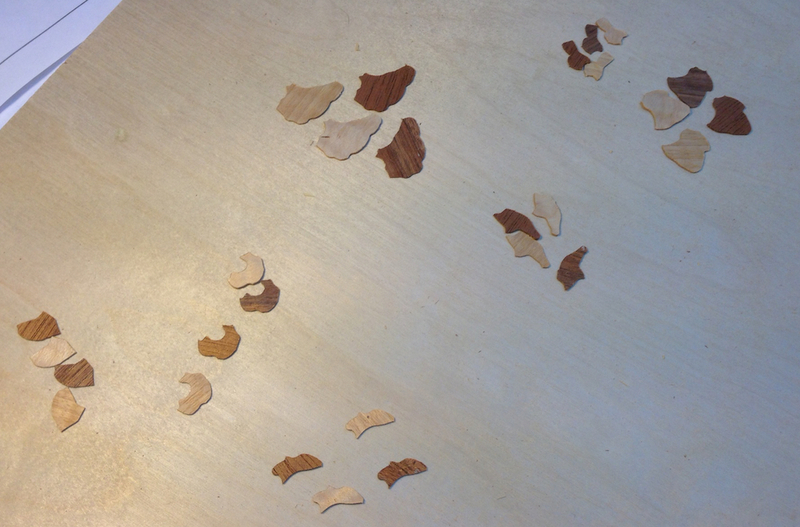 The first step was to pick out four colors, times two, from my dwindling sample pack of veneers. I want a light color for the background, something reddish for the rose, greenish for the leaves and brownish for the stem. Materials for the packet laid out. Front waster board with the pattern glued on, rear waster board, grease paper and 8 veneers. The pattern is glued to the front waster board. I laminated newsprint to all eight pieces of veneer to support them. The newsprint is on the show face and will be removed as the last step prior to finishing. I laminated newsprint onto the back board too to help prevent it from splitting if I end up sawing without enough support. The assembled packet is about 1/2″ thick, and it’s on the edge of what I can cut with the fine 2/0 72tpi blade I’ve been using. I really like the way this blade cuts, it leaves a nice clean edge and it very controllable. It’s also unbelievably fragile. It’s like sawing with a human hair. A brittle hair. I tried the other blade we used in class, and I didn’t like the way it handled. I’m not able to make tight turns with it and I have a hard time following lines. It’s probably (lack of) technique, I’ll put practice time with that blade on the roster for the future. 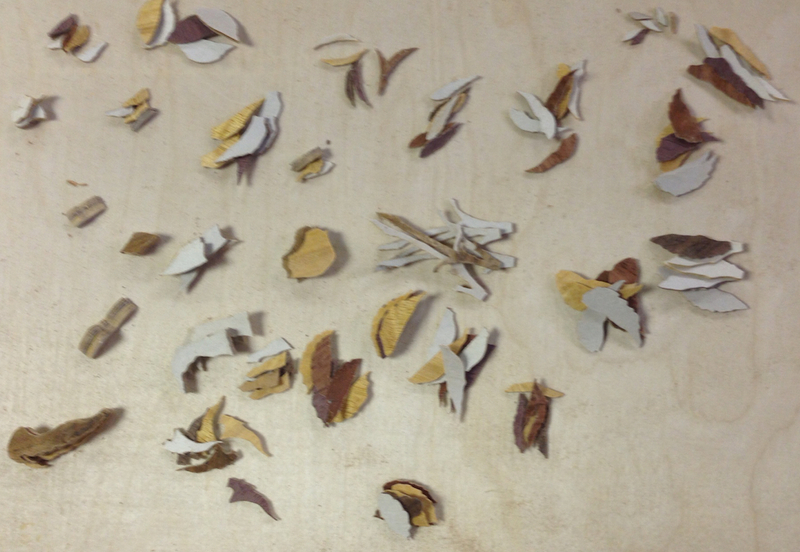 View of the inside of the packet after the first 8 pieces for the lower leaves have been cut out. You can see all of the layers of veneer in cross section as well as the thicker front and rear “waster” layers. I changed up the playlist on my music while I was sawing these to include a selection of country-ish rock songs that were popular when I was in grade school. It was a nice change, but I’m going back to the blues for the rest of the project. I’ve got maybe 3 hours in sawing these parts out, and just another half hour to go. That’s a little misleading, as after each part I’m stopping to pick out the parts for the two main images and arrange them, and them stacking the “extra” parts to the side. I still don’t have the “part organization” thing dialed in. The rest of the parts. I’ll use these to create some experiments in mixing colors to get the contrast in them image. I’m getting more comfortable with my sawing, which is a good feeling. I still had a few missed turns where I was slightly off the line. With the Boulle technique accuracy only matters in terms of having a final image that looks pleasing. Since all of the parts are cut at the same time it’s guaranteed they will fit together. For images like this Rose the assembly of the reverse image may or may not look good, so you might consider the other bits waste. Eventually I want to get my sawing skills unleveled so I can use the “piece-by-piece” method. I’ll eventually do a post on the different types of marquetry and techniques. I’ve got a lot to learn still.